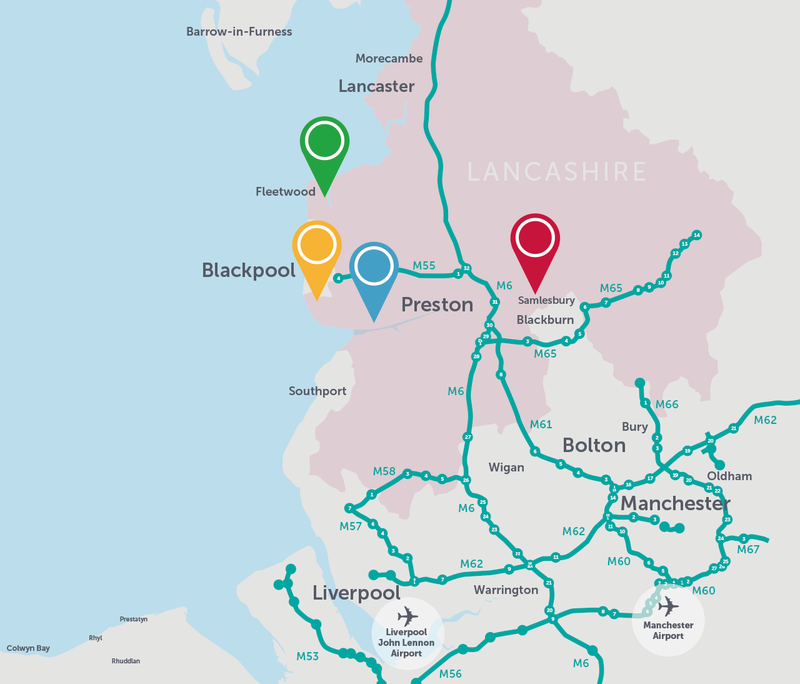 The county’s transport connectivity is first class, with the M6 forming the north-south spine of the road network while the M65, M55, M61 and M58 radiate out to East Lancashire, the Fylde, Greater Manchester, Merseyside and beyond. Rail links are equally efficient, with the West Coast Main Line placing many areas of Lancashire are just over a two-hour train journey of London. Situated only 5 minutes from the end of the M55 motorway, the area is already well-established as a hub for commercial activity, and has a history in aviation engineering. Blackpool Airport Enterprise Zone is within easy reach of all major northern cities, Manchester and Liverpool airports are easily accessible, whilst Blackpool Airport provides private flights, bespoke aviation solutions, as well as regional services and helicopter services to the oil & gas platforms in Liverpool & Morecambe Bay. In addition, the port of Fleetwood, Heysham Port and Liverpool SuperPort are also all easily accessible. Blackpool has seen some £500 million of investment over the last few years resulting in an impressive renaissance. However this only represents the beginning with many more schemes now being actively developed with Blackpool Airport Enterprise Zone leading the way; over its 25 year life span it will transform the Blackpool and the Fylde Coast’s economic base with over £300 million of private investment and the creation of 3,000 jobs supported by new infrastructure. All of this means that a revitalised Blackpool is not just an attractive place to work and visit, but also a great place to invest. Connectivity to Manchester airport, the port of Heysham and Liverpool SuperPort are within an hours drive. Connectivity to all the major northern cities, are available such as Manchester, Liverpool, Leeds, Sheffield and Newcastle via rail from Blackpool.